The Pacific Ocean is hosting a hurricane party. It is the first time three, category four storms exist in one ocean basin at the same time. The staff currently at Kure has remained on island as they are safe from the high winds. However, many of the field teams that were working on the other Northwestern Hawaiian Islands were evacuated as a safety precaution. So far on Oahu the storms have given us a few rainy days, but mostly the storms have created an incredible humidity. The kind of sticky, heavy air that everyone feels compelled to mention in order to excuse his or her sweat. 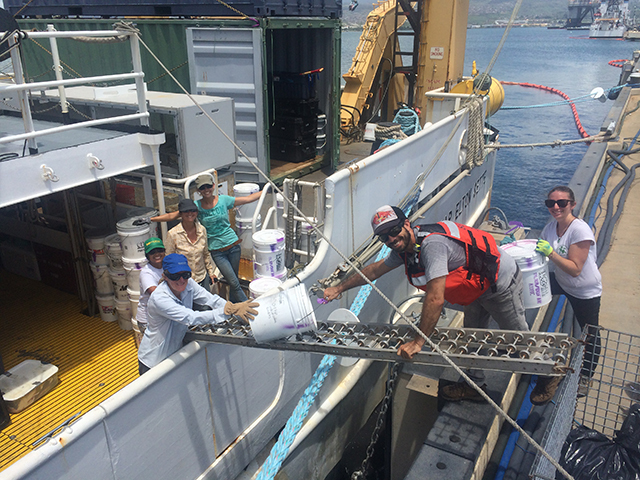 It’s in this heat that we are moving all of our field kit and the many buckets I keep mentioning from base to the ship that will transport them all the way out to Kure. When you only have the opportunity to restock a field site twice a year, there are an incredible amount of items to pack. There seems to be an endless amount of buckets to get onto the ship, so we form a chain. As I pass bucket after bucket to Andy, I realize that the repetitive motion and the heat is a lot like the hot yoga sculpt class I took the night before. I can’t decide if the heat and humidity is making our work harder or just into a better calorie burning activity. Either way, this trip is beginning to feel very, very real. In just over two weeks we fly to Midway, where this ship will meet us and take us the rest of the way to Kure. Earlier this week, we spent an entire day fitting our oversized gear onto trailers and in truck beds in order to bring it to the ship. This is the second day of loading the boat and the whole process feels like we’re playing a life-size version of Tetris. There are large plastic guzzlers that four of us end up rotating every possible direction as we double check there are no loitering bugs and figure out the best way to stack them on the trailer and later onto the boat. There’s an oven that we put together to make sure it works before cocooning it with pillows and bedding. The plywood is swaddled like a baby in tarps to make sure it doesn’t warp. Next to our stacks of field gear, we look like hoarders. After each full day of moving heavy items, I have very few words. It’s a satisfying but exhausting task. Earlier this week, after overloading the trucks and trailers with as many items as possible, one of the donors to the Kure Atoll Conservancy stopped by to meet the team. His enthusiasm for the project is infectious. It was nice to sit and listen as everyone talked story about how they met and the magnitude of work that has been accomplished on Kure due to this man’s generosity.